The next 20 years or so will be exciting in many ways, but especially economically. Americans bear witness to the political gridlock of Washington, D.C. and feel a sense of cynicism, and frustration. The problem is that while the U.S. dithers and its policies and its mindset remains static, the world moves on. There are several countries that have ascended economically in the past 20 years and are hoping to build on that success in the next two decades. 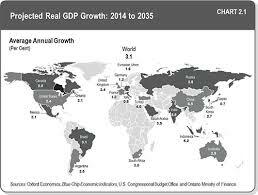 These countries, especially China, India, Brazil, have been amazing success stories, so much so that as of October 2014, China overtook the American economy, albeit in purchasing power and assumed first place. India will also follow China’s lead, harnessing the market potential of its massive population to become a sustained global economic power. The European Union will continue to underperform as a whole, in part because of an aging population but mostly because of economic policies that can often hinder poorer EU nations. The United States will eventually have to do some soul searching and decide whether it will continue with policies and practices that will continue to lead it down a path of even higher income inequality, a less educated populace and less respect on the world stage. Africa, while it still has many issues to overcome, has been making gains in certain keys areas such as childhood education, infant mortality, increased investment, resource extraction and more importantly: political stability, which may very well make it into the next economic “big thing”. Economic projections cannot be made in a vacuum, so I also decided to look at other factors that can have an effect on how economies develop. -First, military strength should be considered a major influence. There is nothing to suggest that the U.S. military would not remain the most dominant fighting force for the next few decades, however, it will certainly face more challenges. History has shown and as many great powers can attest (Rome, Great Britain, etc. ): sooner or later, power wanes. China’s military prowess continues to grow and will no doubt be an even more formidable force in the next two decades. In addition, as more and more developing nations come online, they will require ever increasing amounts of fossil fuels; conflicts are almost certain to arise because of energy – or the lack thereof. The world as a whole will continue to militarize and this, sadly will have an effect on which economies succeed or falter. -Poverty will also be a big factor, as the poor (by necessity) will refuse to be ignored and demand change, leading to some levels of instability in parts of Asia and South America. -Population. It is estimated that in the next 20 years the world’s population will increase by about a fifth to nearly 9 billion souls. The issue of food and emerging diseases will no doubt be a major issue as well as sustainability. How will the planet be able to support 9 billion people who have very little regard for it? -Climate change, the mother of all variables. Climate change for me brings to mind that idiom: “a lot of fingers, a lot of pies”. While it is worth noting that China and the U.S. came to an agreement just this week on greenhouse gas emissions (See: 2014 APEC summit), the fact is, it is too little too late. Climate change is upon us and what we need to do now is mitigate the effects as best we can. Weather has become more violent and unpredictable: droughts have and will continue to ravage sub-Saharan Africa, parts of Europe and central Asia, leading to decreased farmland. Rising water temperatures will continue to affect, and ultimately destroy sea life. In addition more rising sea levels will affect, shall we say more “noteworthy” nations than Kiribati, which as I type is sinking. Even more disturbing, is as the warmer temperatures melt the Arctic ice sheets, previously unattainable resources become attainable and more countries will move to stake their claim – as several already have, setting the stage for future conflict.